The townsite of Bowen's Prairie dates to the mid-nineteenth century. It was named after Hugh Bowen (see Bowen's Prairie Celebrities), reportedly the first settler in Jones County, who arrived in 1836. The village of Bowen's Prairie is shown within the area identified as Hugh Bowen's settlement on an 1839 map of the Military Road. At that time, the state that would become Iowa was part of Wisconsin Territory. 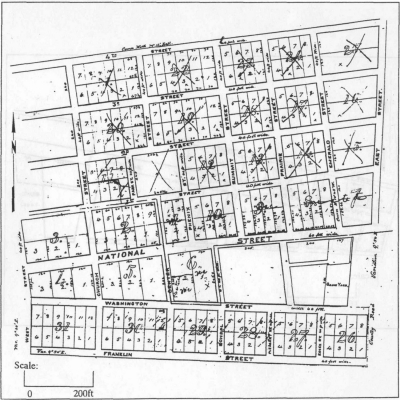 The Census of the Wisconsin Territory for 1836 also records the presence of Moses Collins, whose farmstead (13JN196) has been discovered and excavated in the project area. The village of Bowen's Prairie was first platted in 1853 by Otis and Harriet Whittemore (see Bowen's Prairie Celebrities) and eventually included 30 blocks. The townsite extended on both sides of the Old Military or National Road, today's U.S. Highway 151. At least two churches are associated with the townsite, First Congregational built in 1854 and the Methodist-Episcopal constructed in 1858. In addition to one cemetery, which still exists south of U.S Highway 151, Whittemore is said to have provided land for a parsonage and a second cemetery near the Congregational Church. Structures in early Bowen's Prairie were typically log cabins and houses with limestone foundations, with some of brick. Documentary evidence, oral history, and plat maps suggest the existence in the townsite of a stagecoach stop, blacksmith shop, post office, and general store. By the end of the century, the town was in decline, having been bypassed by the railroad which diverted settlement and business to nearby communities such as Cascade, Monticello, and Sand Spring. The closure of the post office in 1902 saw the landscape revert to farmland. Archaeologists have discovered evidence for the Congregational Church, parsonage, a barn or livery stable, post office and general store, rammed earth structure, and early cabin at 13JN152. The Church, which stood on Lot 1 of Block 3, was constructed in 1854 and was utilized throughout the nineteenth century. It is one of at least two churches originally associated with the townsite. The second, the Methodist-Episcopal, has not been discovered and may not have been within the townsite as originally reported (see The Palmer Church Site 13JN169). Local residents dismantled the Congregational Church after it fell into disuse, and archaeological evidence of its existence is ephemeral. Remnants of a faint limestone alignment and mortar confirm its northern and western walls, and its eastern wall appears as a slight mortar stain. Artifacts found nearby include limestone, mortar, flat glass, wire and machine-cut nails, and white earthenware (see Artifacts from Bowen's Prairie). A 1910 Jones County history documents that Otis Whittemore donated the grounds for the church, cemetery, and parsonage. Residents today report the removal of headstones, but no additional evidence for the cemetery has been found. 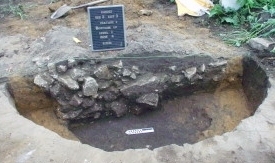 A structure identified as the parsonage, however, was discovered in the presence of a limestone and mortar foundation, large refuse pit, cistern, collapsed limestone well, and nearby privy. Artifacts here date from the 1860s to the 1920s. A barn foundation occurs on the same city lot. 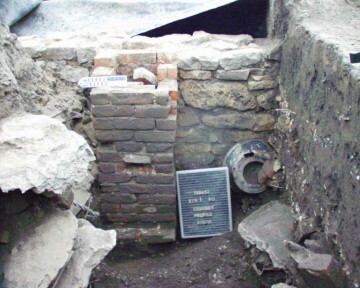 A limestone foundation with a substantial basement, internal chimney, and load-bearing wall represents the former location of a building believed to be a post office and general store. This structure had two stories and was divided into front and back rooms. The postmaster's family probably lived on one side of the building. The quantity and type of artifacts found is too abundant to represent either a house or post office alone and includes intact glass jars and bottles, metal pans, kerosene lamp parts, porcelain doll fragments, and hardware. Six evenly-spaced, limestone pillars, the remnants of a barn or livery stable, occur just to the south. Artifacts from this feature consist mainly of metal items including barrel straps, numerous nails, and harness parts. 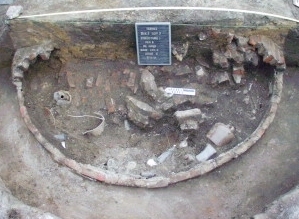 Due east of the post office/general store, a remnant of original Church Street was uncovered in the remains of a gravel lens mixed with coal and slag. 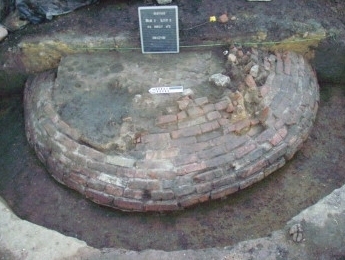 What may be the earliest feature at the site was found during the final weeks of excavation. It appears to be a small cabin with artifacts indicative of a pre-1850s occupation. This may be the actual cabin of Barrett Whittemore. The most enigmatic feature at the site is a large, rammed earth structure, possibly a granary constructed during the 1870s (see A Mystery Structure).